Spring is teeming with activity and life! Despite the wintry weather that greeted us at the start of spring semester, that activity and life certainly was evident with the work of our students, faculty, staff, and alumni of Shippensburg University. We celebrated success in many ways at the start of the new year. Our field hockey team won its third consecutive NCAA Division II National Championship in December, the fourth championship win in five years. These ladies lived up to their theme—relentless pursuit—on the field and on campus! 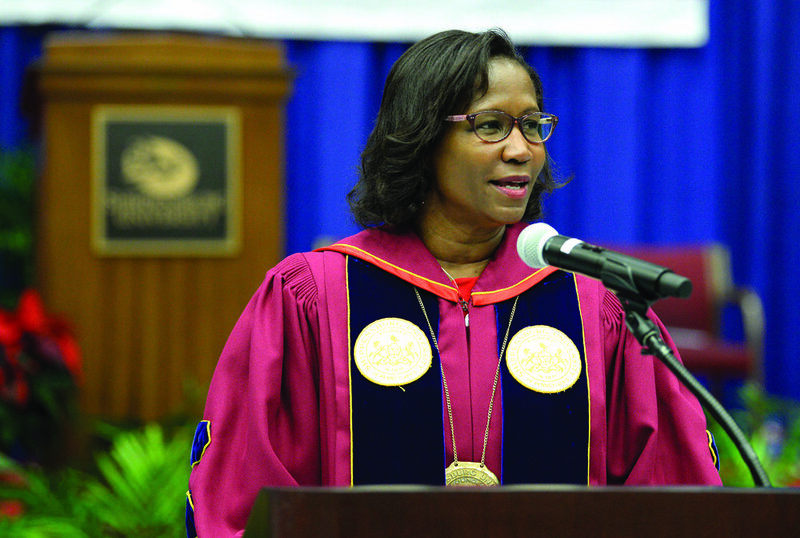 Dr. Laurie Carter addresses Shippensburg’s newest graduates during winter commencement. Celebrating the field hockey team’s third consecutive national championship. Our university earned several notable grants, thanks to the hard work of faculty and staff, including a $70,000 Pennsylvania Liquor Control Board grant to boost Pennsylvania workers for the growing brewed and malt beverage industry, a $60,000 PASmart grant to develop an Early Childhood Apprenticeship Program, and $18,000 from Gov. Tom Wolf to continue the fight to end sexual assault. We also were named a bicycle friendly university by the League of American Bicyclists. This issue of the magazine highlights the continued ways we work with our community. Members of the Shippensburg University Resource Coalition share on page 26 how their organization has grown and responded to community needs, while also creating educational opportunities for our students. In a different way, our Art and Design Department launched an impressive New York City exhibit in Kauffman Gallery for the university and community. The exhibit and related events provided a unique chance to experience talent from one of the art capitals of the world on our own campus. We welcome five new members to our Council of Trustees on page 8, and congratulate our winter graduates! With warmer weather on the way, there is plenty of activity to look forward to. I hope to see you on campus this spring! With the start of fall semester, our campus has been a flurry of activity! 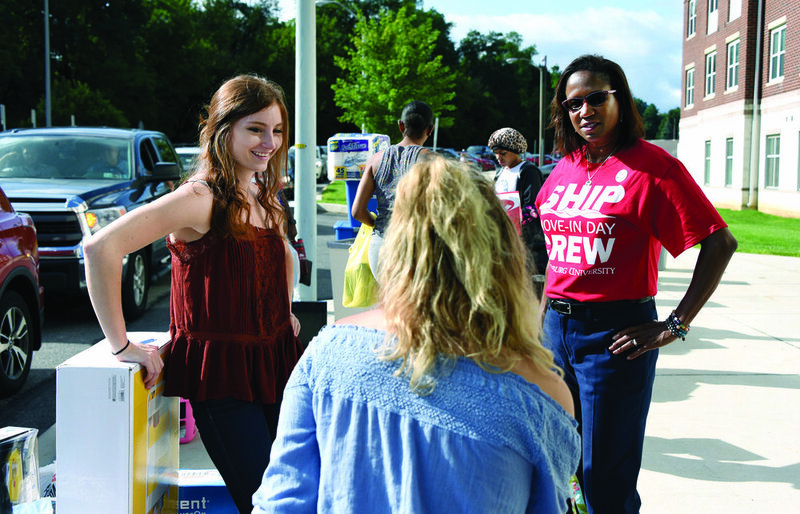 From move-in day and Welcome Week to our annual Parents and Family Celebration and introducing our first-year students to the college experience, the entire Ship community is focused on the success of our students. President Laurie Carter takes time for a photo with Big Red and the Harrisburg Senators’ Rascal during Ship Night with the Senators in August. Our student support resources are now under one roof. We’ve reallocated our space in Mowrey Hall as the Student Success Center, which includes services such as the Learning Center, Academic Success Program, Department of Academic Engagement and Exploratory Studies, and International Programs and Studies. Our First-Year Experience faculty and Peer Anchors are acclimating our new students to life on campus and supporting them in reaching their academic goals. Sarah Kistner, one of our Peer Anchors, discusses her experience in the student section of this issue. This fall, we also hosted the first State System conference on student success. We continually take pride in the quality of our programs! We recently announced the School of Engineering, which includes the departments of Computer Science, as well as Computer, Civil, Mechanical, and Electrical Engineering. Plans for the school’s new home are underway. A new Peace Corps Prep program primes students to enter the Peace Corps after completing focused coursework and experiences. We’ve developed a new online degree completion program centered on the needs and availability of our adult learners. We also are proud to see several of our students defending their dissertations in the Doctorate in Educational Leadership. 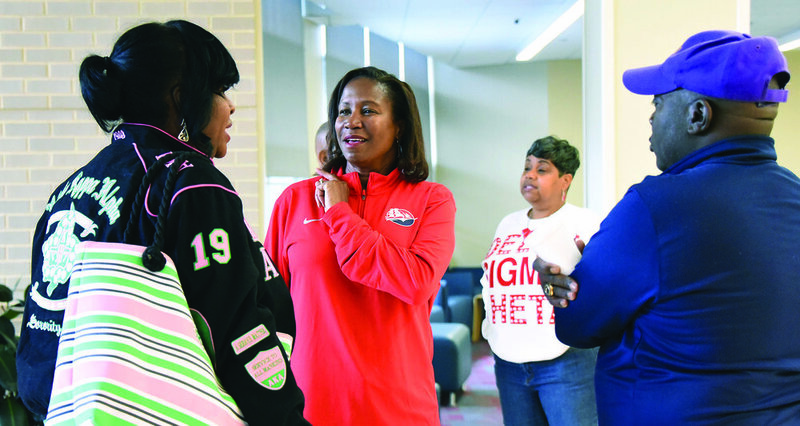 Visiting with members of the Divine Nine during Homecoming Weekend. Getting to know students during move-in day. A beautiful homecoming weekend provided the opportunity to welcome back alumni and share our passion for Ship! In the midst of celebrating, I was happy to join our Greek students and alumni as they dedicated time for community service at King’s Kettle Food Pantry. The homecoming committee also raised more than $12,000 for the Hound Packs Program, which provides meals to food insecure students in the Shippensburg Area School District. What a great effort! Our students, faculty, staff, and alumni have excellent stories to share. In these pages, you’ll read about our top-ranking ROTC students and Zach Sims, a four-year scholarship recipient who has truly found a supportive family at Ship. Our alumni continually impress with their creativity and professionalism in careers such as theatre arts and unique positions in the professional sports world. Also hear how Mark Duckworth ’02 worked on the team at Children’s Hospital of Philadelphia to introduce new therapy in the fight against pediatric cancer. It’s hard to believe that it’s been a full year since I first shared my story with you through the magazine. We’ve had fun, faced challenges, and made waves at Ship and in our community. In addition to the new faces we’ve welcomed on campus, I had the pleasure of introducing Dr. Dan Greenstein, the State System’s new chancellor, to our university this fall. As my Ship journey continues, I’ve asked all members of our university family to keep student success, sharing our story, community engagement, and quality as the university’s four priorities. Together, we are charting a strong course for Ship!